APRIL 2007 -- Have you ever been asked, “Where is your Grange Hall?”, or “Where does your Grange meet?” If you are planning a special event it is important to give your visitors directions to your hall. Your hall should be well marked with the name of your Grange at or near the entrance to the building. If possible, you should look into placing directional signs near the hall to help those seeking your Grange. These could be simple, temporary arrow directional signs placed along the roadway. They can be fashioned out of heavy cardboard and attached to stakes driven into the ground. 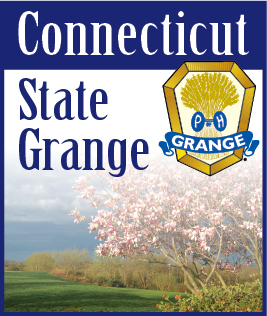 If your Grange would like to place a more permanent sign, National Grange has available a metal Town Marker Sign and Informational Panel. To order these items, contact The National Grange, 1616 H Street NW, Washington, DC 20006, or go to the National Grange's website, www.nationalgrange.org and click on Grange Store. The Town Marker Sign is Item #332 and is $25.00 while the Info. Panel is Item #333 and costs $5.00.